We all know about the power of full moon spells, but don't neglect the energy of the other moon phases. New moon spells can be quite powerful as long as you target the right purposes during this time of the lunar cycle. The new moon is the time for beginnings and new projects, so this is a good time to work some magick towards a new path in your life. Needless to say, cast these spells during a new moon phase. Get everything together and write your intentions on the paper. Keep it to a word or two, but enough to represent what you want to accomplish during this new moon. Put a little soil in the flower pot, then place in the bit of paper (fold it up), and then crush some egg shells on top of that. Fill up the rest of the pot with soil. Bring me success, I ask it true. Keep repeating this as you plant your seeds, and give them a little water. 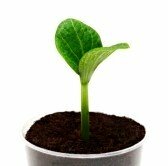 After the ritual, keep the pot somewhere sunny and you should start seeing some success in your plans when the plant begins to sprout. Keep it healthy and thriving to keep the magick going. I cast this spell to get a hire. I need a new job soon. After all the candles are lit, take each stone and gently pass it through the flames (careful of your fingers). Then hold the stones in your hands and visualize the type of job you want to get. After the spell, pocket the stones and carry them with you. You should have a new job by the next new moon.